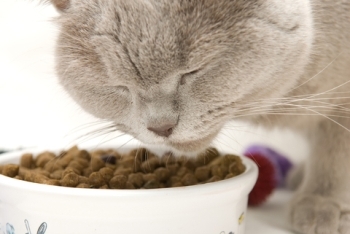 Does your cat throw up after eating dry food, but not after eating wet food? This situation can puzzle cat owners. Here are five reasons that may be causing the vomiting. The dry food might contain an ingredient the cat is sensitive or has an allergy to, whereas the canned food might not contain this same ingredient. To determine if it’s a sensitivity or food allergy, you should perform food trials. Food trials are essentially testing various foods with your pet to determine if they have an adverse reaction to certain foods. This can help narrow down which ingredient(s) caused the reaction. If there is some sort of obstruction in your cat’s digestive tract, soft canned food might be able to pass around it, whereas dry food might not be able to. This is a potentially life-threatening situation and requires veterinary attention. Dry food expands when it reaches the moist stomach contents. If a cat eats too quickly or eats too much, when the food expands in the stomach it might make them nauseous. Some cats with inflammatory bowel disease seem to tolerate canned wet food better than dry food. Choosing a high quality, high protein, and grain free canned food can also help. This is an unlikely cause, but it should be ruled out by your veterinarian. Pets Best Insurance plans can reimburse up to 100% off your vet bill!